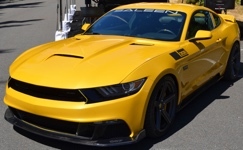 The 2015, Saleen Mustang is available in three upgrade levels a 450hp 302 White Label, 715hp 302 Yellow Label, and a 730hp 302 Black Label. The Black Label includes a completely redesigned front end with a longer hood, narrower grille, and cool lower splitters. This is the Saleen 302 White Label Mustang. It has a 450hp 302ci 5.0L V8 with Saleen 302 styling package, Saleen brakes, Saleen suspension, Saleen wheels, and Saleen badging. This is the 2015 Saleen brochure or hero card. On the front a yellow Saleen 302 Black Label is shown with the Saleen wheels, front and rear fasicas, quarter window trim/panel, hood, and graphics. The specifications for the 2015 Saleen S302 White, Yellow, and Black Label Mustangs are listed on the back. This is a Saleen 302 Black Label at the Saleen display in the 2015 Mustang Roundup in Bellevue, Washington. Under the hood is a 730hp Saleen Supercharged V8; working heat extractor hood vents; 20 inch 5-spoke wheels; redesigned the entire front fascia to with a high volume radiator intake, front air vane with static brake cooling and chin air splitter; S4 suspension; 13.9" vented 4-piston Saleen brakes; and a complete Saleen interior to name a few.